Often parents may wonder whether it’s best to hire a ski instructor or try to teach their little ones themselves. I believe that if you are a passionate skier yourself you will be their best ski teacher. Parents know their kids best, they know how to motivate and talk to them. They know their boundaries and when to stop because they are tired. And they’ve probably already lit the fire for a passion for snow and skiing at home. If you yourself enjoy being on the mountain take your kids with you. Get them some boots and skis and let them get used to the feeling on snow. Let the fun already begin at home and have them walk around in their ski boots on safe ground, as well as trying on their skis. Our two year old used to take his nap with all kitted out in his ski gear in autumn because he couldn’t wait for winter to arrive. Ski Boots seem to start at size 24/Mondo size 14.5 (we couldn’t find smaller ones). If your kids with smaller feet are impatient to begin skiing you can start to use them earlier with thicker socks. Our kids started with size EURO 21/22. Beginner skis should not be taller than your kid’s bellybutton. For intermediate skiers they should reach to the chin and for advanced skiers you can use skis that reach the nose. Consider renting for the season. Layering your kids clothing is key to a happy mood in all temperatures. The colder it is the more layers you will need. It is essential that your kid is warm enough, otherwise there won’t be much skiing. There is no need for poles when your kid is just learning to ski, they are just distractions. As soon as your kid masters the blue slopes you can introduce poles. A sled will be your savior! Not only can it help you get all your gear from car to ski piste but it also will save the day when your kids are too tired to walk back to the car..
You won’t need to bring along any teaching tools for that first skiing experience, just find a ski area with a magic carpet, your kids will love going for a ride. Pop them between your legs and let them get used to feeling of skiing - throw in a small jump or two if you feel confident enough. 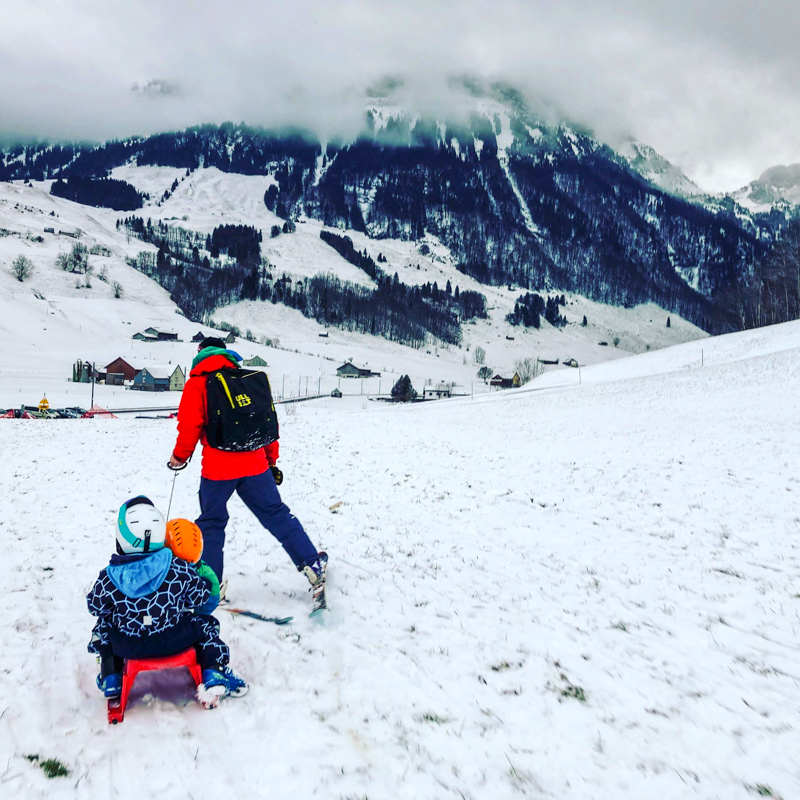 Once they are a little more confident on their skis take a parent pole (or your ski pole), hula hoop, or buy a special ski safety belt for toddlers. We use the “easy turn” belt to take our 2 year old with us on the slopes. The most important thing is to have fun together. Your kids will feel your enthusiasm and pick up their new found skill pretty fast. But don’t push them, you want them to share your love for winter and skiing. If they are tired let them take a break, a hot chocolate and a lollipop- skiing is hard work for those little legs. Once they can stand and ski on their own, find little ski jumps and natural obstacles that they can proudly jump - there is nothing like watching your kids catching air with their skis for the first time. And this is something that they will love to show off. We are Julia and Daniel, two german-swiss-american skiers based in the Swiss mountains. Before we had kids our world was all about skiing and being in the mountains. Now we have three little boys and take them wherever we go. With our adventures we want to inspire other parents to make the effort and go out there- because it is so worth it! You can follow us on Instagram.